Where Eagles Dare could well become the catchword for the next generation of local golf luminaries if Harsha Abeywickrema, the newly elected president of Sri Lanka Golf Union, has any say. And he is determined to make his presence at the helm of the proud 72-year-old institution count. “We, the newly-elected committee, wants to raise the standards of the game in Sri Lanka. 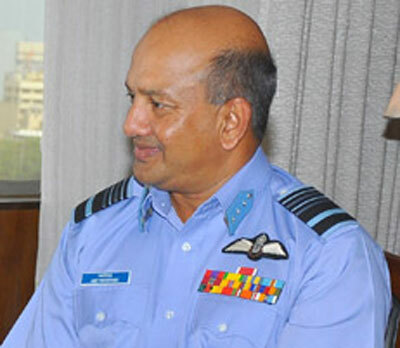 And we want to do a thorough job,” stressed Abeywickrema, the former head of the Sri Lanka Air Force. Earlier this month at the annual general meeting of the Sri Lanka Golf Union, Air Chief Marshal Abeywickrema was elected unopposed as president. His team includes Sanjeeva Vairawanathan (vice-president), Nishan Navaratne (hon secretary), Sudath Kumara (treasurer), Usha de Silva (asst. secretary) and Naveen Gunaratne (asst. treasurer). The Air Chief Marshal has a formula all worked out in his head: to use the three golf courses he had a hand in building during his tenure in the Air Force as key facilities to promote the sport amongst schoolchildren in the area. Built on Sri Lanka Air Force land, the three courses obviously have an Eagle in its name – Eagles Golf Links, an 18-hole scenic course at the SLAF Academy in China Bay, Trincomalee; Eagles Heritage Golf Club, 9-holes, at the SLAF base in Anuradhapura; and Eagles Catalina, 9-holes, at the SLAF base in Koggala. “I created these golf courses during my time in the Air Force and they are now proving to be an invaluable asset for the sport and the Sri Lanka Golf Union. The aim is to get schools in these areas to try their hand at golf so that we can identify talent,” says Abeywickrema. The new committee has joined hands with banking giant HSBC and launched the Future Lions programme targeting schoolchildren in Anuradhapura, Trincomalee and Koggala. Move over Tiger Woods, the Lions are in the hunt. The massive backing from the Sri Lanka Air Force for golf has had a ripple effect among the other branches of the Armed Forces with the Sri Lanka Army and the Sri Lanka Navy also getting involved with providing courses in Diyatalawa and Welisara respectively. The development push will go into over-drive when HSBC and Sri Lanka Golf launches its second Future Lions programme at the end of this month where 480 schoolchildren aged 10 to 14 years will get an opportunity to get into the swing of things with a golf club in their hands. The programme, which will also involve the Ministry of Sport and the National Olympic Committee of Sri Lanka, will begin at the Eagles Golf Links in Trincomalee and end at the course run by Shangri La in Hambantota. “At the end of the day, if we are able to identify even a handful of young talent, it will be worth it. For too long golf has been neglected for various reasons. I want everyone to come together for the good of the game and support us,” Abeywickrema added. It seems the Eagle has landed for local golf.